This clock houses the flagship nine tubular bell cable driven Hermle movement. The Luxus dial features the four cornices with raised borders surrounding filigree netting, which is repeated in the center of the dial. The brass aluminium roman numerals are laid onto a brass aluminium dial ring, making for an understated luxurious dial. 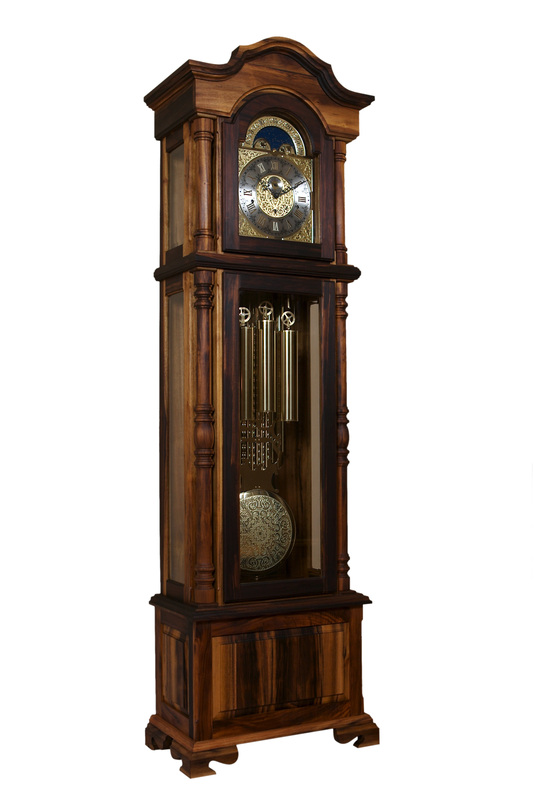 This clock is pictured in Ocotea Bullata (Stinkwood), or Cape Laurel, a rare hardwood grown in the Tsitsikamma Forests. The nine Tubular bells, visible behind the weights and pendulum, sound the Westminster, Whittington, and St Michael melodies, and has an automatic night silencer option. Whilst housing the largest movement, the cabinet is distinctly well proportioned. Price: ZAR 148 000.00 Incl. VAT; Excl. Delivery. Copyright © 2005 - 2019 Tic Toc Time.